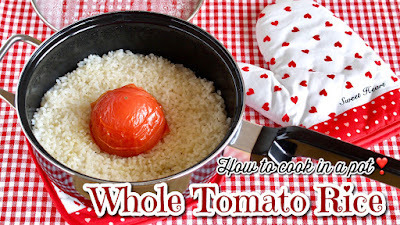 After sharing the Whole Tomato Rice using a rice cooker, I received many requests using a pot and a soup stock. Kombu soup stock adds UMAMI. Yummy!!! 1. Wash rice (4~5times), drain in a strainer, then leave for about 30 minutes. 2. Place the rice in a pot, add Kombu soup stock and the seasonings, then mix well. 3. Remove the tomato stem (and the bottom if you want) and place it in the pot. 4. Put on medium, when it comes to a boil, cover, turn down to low, then cook for 13 minutes. 5. When it's done, stop the heat, do not open and let it steam for about 15 minutes. 6. 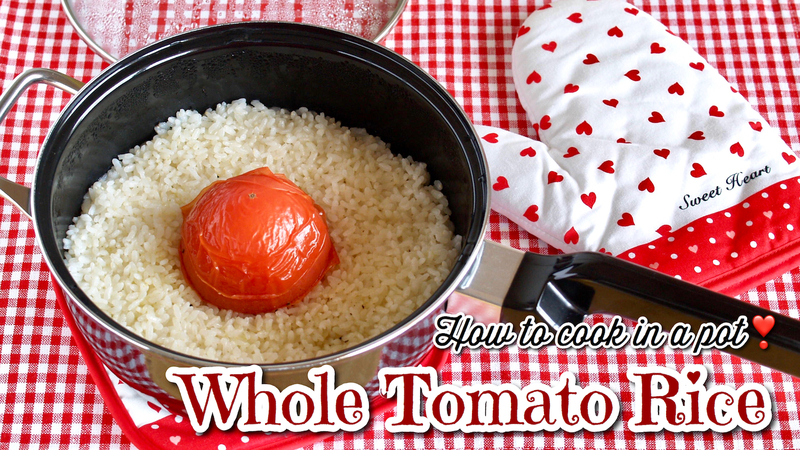 Remove the tomato skin if you don't like it, toss the rice lightly using a rice paddle, then serve. I used Kombu soup stock No MSG / No salt added. If you want to use the soup stock seasoned with salt, please remove or reduce the amount of the salt in this recipe.